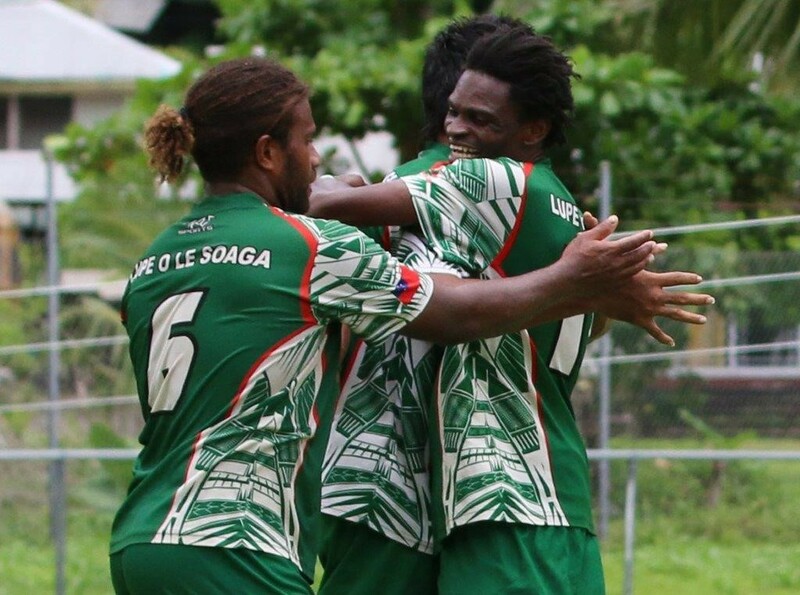 Lupe Ole Soaga have taken the final slot in the OFC Champions League 2018 Group Stage after winning 6-0 against Veitongo FC to secure second place at the Qualifier behind Cook Islands club champions Tupapa Maraerenga. Tupapa sealed their place at the top with a clean sweep with a 5-0 win over Pago Youth in the day’s final match, earning their place in Group A of the next stage. Lupe Ole Soaga and Veitongo started in a measured manner with both sides in with a chance of progression at the beginning of the encounter. Although the best chances went to Lupe, they were being kept from scoring by Veitongo goalkeeper Semisi Otukolo, making his first start of the competition and showing he deserved his place in the line-up. However after taking a match-ending knock making a crucial save and having to be replaced, the momentum for Veitongo lapsed and in the 30th minute Bird Vaiaga found the back of the net. Suivai Ataga followed that up before a further goal to Vaiaga was followed up by a strike from defender Andrew Setefano to make it 4-0 at the break. Half-time substitute scored twice in the second half to extend the Samoan club’s lead to six. Lupe Ole Soaga coach Paul Ualesi was proud of his team for securing a place in the OFC Champions League Group Stage once again. “I think it’s a really great opportunity for our team to participate for this second stage. Thanks to all of the supporters who support our team all the way, and thanks to American Samoa for good hosting, thank you for everything,” he said. His focus is now on the next step in the campaign which is in Group D being held in the Solomon Islands, where Lupe will face 2017 runners-up Team Wellington, semi-finalists AS Magenta and Marist, knowing that it will be another step up for the side. “For now we’ll have a little rest, maybe two or three days, then we’ll be back on track because it’s not really long. Maybe two to three weeks and it’s the second stage so we need to prepare. It’s a different level over there, that’s why we’re trying to handle that kind of pressure. Veitongo coach Timote Moleni wasn’t happy with his team’s performance overall in the tournament and plans to go back, make some adjustments and prepare for Tonga’s Major League in the hopes they can return and final prove themselves. “I would like to congratulate Lupe Ole Soaga for giving us a great game. Our weakness is really obvious, the finishing, and I will go home and work on that plus we have a long period to prepare and train,” Moleni says. In the final encounter of the competition, home side Pago Youth took on the table leaders Tupapa Maraerenga hoping they’d be the blip in their opponents otherwise perfect record. Although Pago Youth threw everything into defending it wasn’t enough to keep their experienced rivals at bay as Maro Bonsu-Maro found the net with relative ease in the seventh minute before Geoffrey Strickland scored a second. Heavy rain had an impact on the pitch for the latter part of the first half and both teams struggled to adjust. By the time the second half rolled around Tupapa had received enough instructions from coach Alex Napa to invoke a different approach which paid off as Bonsu-Maro and Strickland each scored a second before Sean Latimer added a fifth to the tally. Napa was really pleased with his team’s performance although noted that the weather although different to previous match day’s provided just as much of a challenge. “It’s a bit hard in the type of weather we have now but we started off on a good note when the pitch was dry. That was the way we wanted to play, moving the ball around. But as soon as it changes, it turns those nice passing games into a non-event,” he said. Tupapa Maraerenga progress to Group A in Vanuatu where they join Lae City Dwellers, Nalkutan and Ba in two weeks time. Napa said he expects it to be tough-going for the team, who will be appearing in the Group Stage for the first time as a Qualifier winner, although they have made one previous appearance in a different format of the competition. “There will be higher level opponents so we’ll need a totally different game plan obviously. We’re going to have to look at probably a more defensive type of game because the teams we’re going to be facing won’t let you have too much time on the ball so a different kind of approach,” Napa added. Pago Youth coach, Li’atama Amisone Jnr. thought his team had an okay outing today but believed there is plenty of potential in the side which he hopes has a chance to shine in the future. “This wasn’t the outcome I was expecting but it’s ok as a learning experience for these guys,” he said. “There’s a lot of young guys and maybe in the future, the near future, they’ll have better experience and they should be better down the line.